Oh my friends! I am doing a happy dance right now! Gone is the snow and the never-ending dreary gray winter days. The sun and the warmer temps have finally arrived – let’s just hope it’s here to stay! I’m starting the spring celebration with a centerpiece on my kitchen table arranged in my new Smith & Hawkins galvanized steel tray that I picked up at Target. The tray fits my table perfectly – nice and long without being too wide or with sides that are too high. To put my centerpiece together, I raided my stash closet and kitchen cabinets for dishes, linens and silverware. I didn’t really have a plan in mind – I just started gathering things that reminded me of spring and combined some of them together. Foremost in my mind was using lots of texture in my centerpiece. Any decor without texture will fall flat every time. Secondly, I made sure to include objects of varying heights. 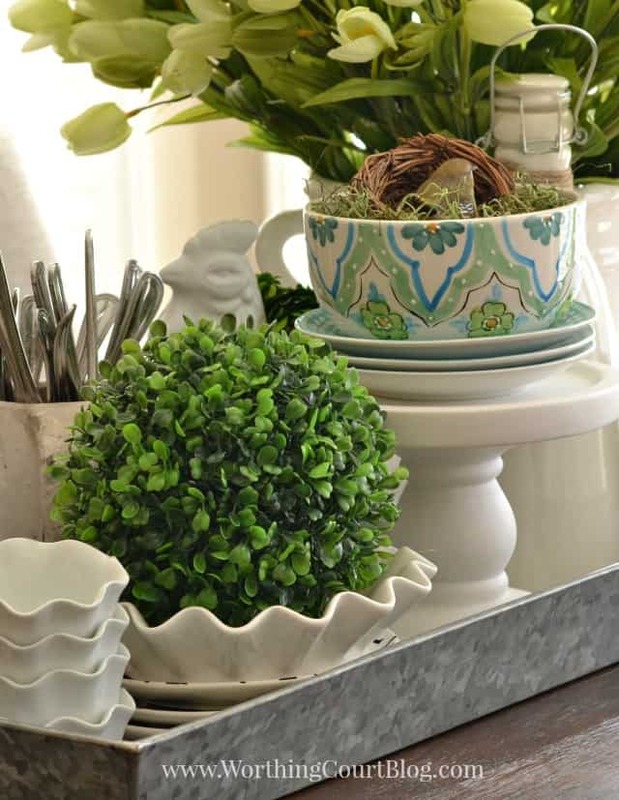 The highs and lows help to draw your eye and keep it moving all around the centerpiece. If everything was one level, your eye would tend to just skim over it. Besides the tray, the only thing that is new are the glorious tulips that I found at At Home (formerly Garden Ridge). I couldn’t believe how realistic they looked for the price. My container has a very wide opening, so I added four bunches of tulips in it. My chippy white bird is perfect nestled on a bed of linens on top of a stack of white dishes. Every time I see that little bird, I’m reminded of how the movers just knew that I wanted to “throw that old thing away” when they were packing for our move to the new house. I told them they were crazy and then they looked at me like I was crazy. Ha! Another little bird is sitting on her nest ready to lay some eggs. My kitchen table is one of the first things that I see when I come in from the garage and this spring scene makes me happy, happy, happy. Update: I finally completed the makeover of our breakfast area after I wrote this post. In case you’re new here or if you missed it, you can take a look at the completed area HERE. And get the tutorial for the diy projects that went into completing the space HERE. Suzy, I’m with you – turning my back on winter for good! It’s amazing what a weekend of nice temps and sunshine can do for the soul (and the decorating spirit!). Your centerpiece looks really nice and springy. That would make me happy to see first thing when entering the house too. Enjoy! Oh Suzy, your vignette just says “welcome spring”! I am glad the winter yuck is gone too. I just wish this warmer weather would be accompanied by just a little less rain! Love the vignette! The blue and green bowls are my faves! It’s so green and white and I love it! 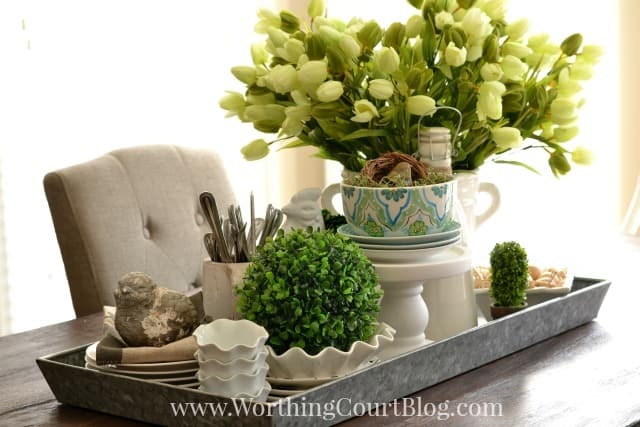 Love your spring centerpiece/vignette….especially the tray and the tulips! Great inspiration….thanks for sharing! Hi Suzy- that’s my kind of fun! 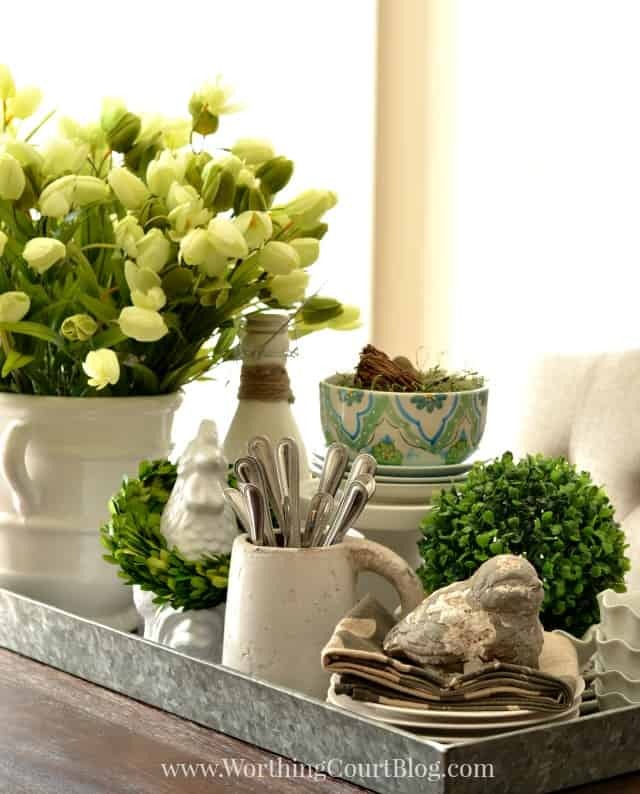 Love the galvanized tray. I will have to go check that out at Target. I love to stare at a collection like this and enjoy each piece. So the movers wanted to help dispose of the little chippy bird!! LOL….sounds like something my husband would want to do! I do love those tulips. I found some at a PB outlet that are pretty darn real looking too but I don’t think they are as full as yours. Hi Liz. Yes, they wanted to get rid of my chippy bird. Crazy movers. Ha! You are so fortunate to live near a PB outlet. I have to travel 2 1/2 hours to get to one. This is beautiful and I thought the tulips were real! Great inspiration! 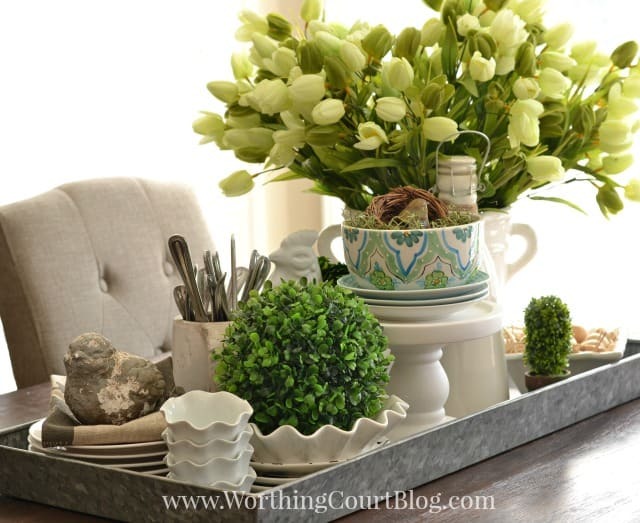 Love your tray vignette! So pretty and springy! You’ve added just the right colours, textures and heights to make it all so interesting and fun to look at it. Love all the dishes with the scalloped edges. I had to read it twice that those tulips weren’t real! Hi Lori. It’s amazing how far silk flowers have come! I’m so glad that you like my vignette. Just gorgeous – I can’t believe how real they look ( the tulips ) we’ve come such a long way with faux flowers and plants – I can remember when they were very obviously fake from a distance lol ! I remember that too, Suzan. It’s hard to believe that each bunch of these tulips was just a little over $3! This looks stunning, your styling is just beautiful! Love your blog. I’m so glad I found it at Martina’s party! 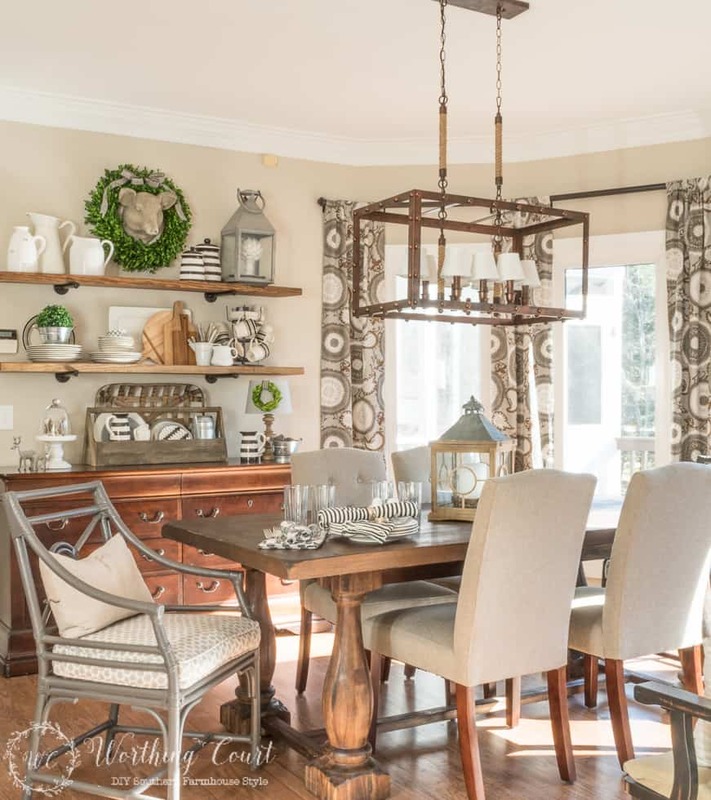 Suzy, This is such a pretty Spring vignette and I love your dining room. Thank you for joining the Share Your Style party. I am so happy that spring is here too! I love warm weather! I love your spring centerpiece! I just started trying to set up tablescapes and centerpieces! Thanks for the inspiration! Pinned it! Suzy, it all looks so lovely and very inspiring for spring. I’m pleased for you that you have waved good bye to dreary winter. Here in Australia we are enjoying the last days of summer. Thanks for linking up at Shabbilicious Friday. Love your spring touches Suzy. It looks great on your table. Also loving the pig on your wall! :) Thank you for partying at my place last week. Hope you are having a great Wednesday! This is stunning, Suzy! You had some great tips too that I’ll definitely have to keep in mind when I create my next tablescape. Thank you for this! Oh, my! I want everything you have pictured for myself!!!! That little chippy bird was the first thing that caught my attention. And those tulips! Until I read through your post I was sure that they were real. You’ve made such a pretty display that looks perfect for spring but can be used anytime. Thank you so much for linking up some fantastic posts with us this week at Your Turn to Shine. I always love seeing what you come up with, Suzy, and your party is always my biggest source of link party traffic each week 😉 Have a fantastic Easter weekend. Thank you – I’m so glad that you like my centerpiece. I’m really happy to attend your party, Jamie and I’m so happy that you get good traffic from The Scoop! I just invited you to share at our Thurs. parties and now I see that you had linked up already… what a coincidence! I had just found your blog from The Scoop link party! 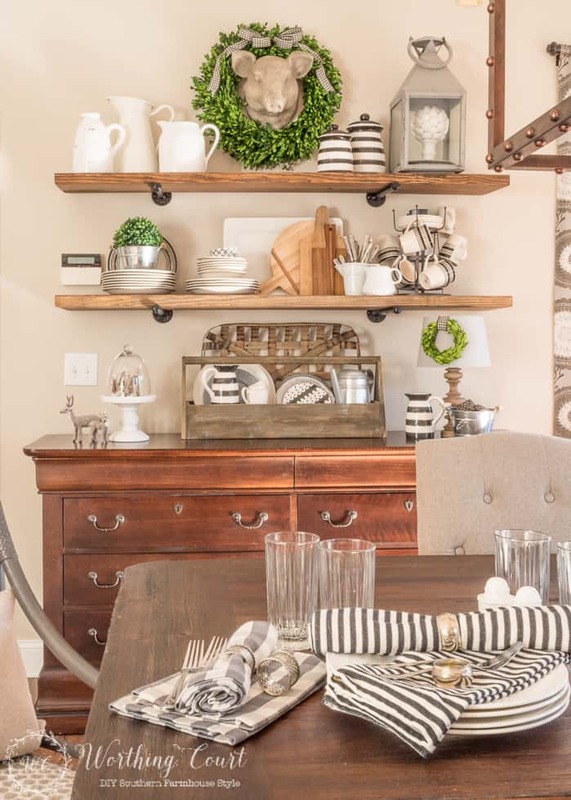 Your spring décor is gorgeous, Suzy! Thank you, Kendra. So glad to be going to your party too! This is lovely! I love all the pieces you put together. 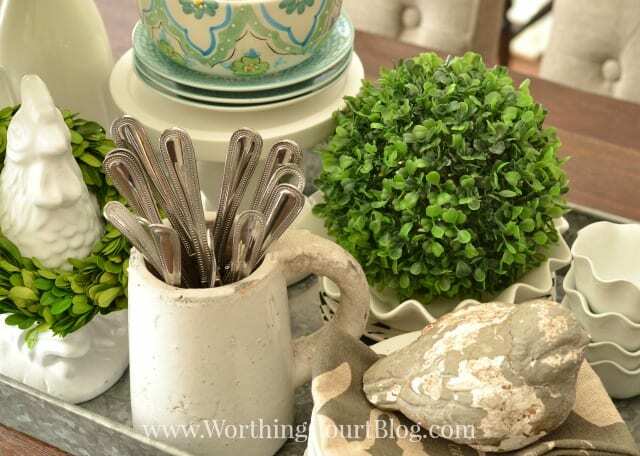 I adore your springtime vignette and the galvanized tray is the perfect setting for your lovely decor! What a pretty display! I especially love the container the tulips are in. Thanks for linking up to Small Victories Sunday link up! What a lovely centerpiece! I really need to start doing more with decorating. I am so bad about changing it up! I’m so glad you shared this with us at #FoodieFriDIY…it gave me some ideas! Suzy – thank you for stopping by Tuesday Treasures to see your feature! You used my favorite colors! I always enjoy your home and thank you for hosting the Scoop as well! Have a wonderful week! Hy Suzy..I want the pig on the wall. Where can I find it. 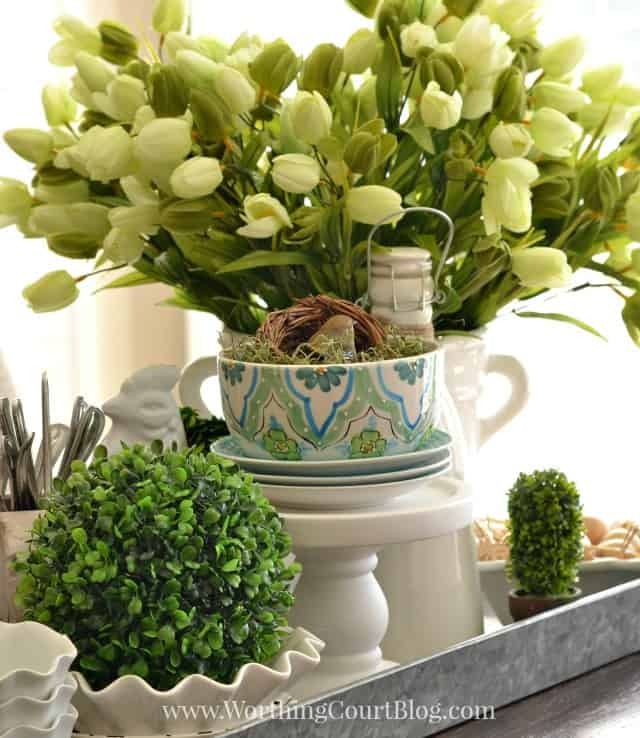 The Spring table with tulips is awesome. I have been wondering if it is to early to start Spring décor. My favorite time of year.